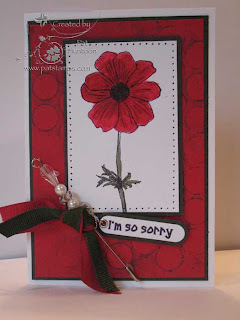 One of the best reasons to send a card to someone is to beg forgiveness. That is why this week's giveaway is so wonderful -- the sayings on this stamp sheet from Firecracker Designs by Pamela are great! One lucky winner will receive the stamp set above along with the card on the right. The card was made using a Wet Stencil background (April 2009 Technique Junkie Newsletter) with the poppy from the sheet colored using the Pencil over Marker Technique (February 2005 TJNL). To enter this giveaway for the card and stamp sheet, place a note in the comments section with your entry. Enter by 11:59pm EST on Sunday, May 3rd 2009. No other entry methods will be included in the give away. If you email me to enter, your entry will NOT be considered a valid entry. When you leave the comment, make sure to put your NAME in the comment -- if you enter your comment as "Anonymous" - or you just enter with your first name, I cannot give you the prize! Blogger does NOT record your email address for me, so you will need to check back to find out if you have won or include your email address in your comment so that I can notify you. A good way to do this is like so: phuntoon at optonline dot net -- it will help protect your privacy! I will have a random number generator pick one number from the comments to select one winner. Enter today -- good luck! The winner of this giveaway is Jasmina Bursic -- congratulations, Jasmina! I am thrilled to have these gorgeous stamps to giveaway this week. Our Sponsoring Giveaway vendor is Chapel Road/Class Act Stamps. This stamp company is two combined -- Chapel Road Artstamps, and Class Act Stamps. Carol Harrison owns them both -- make sure to take a peek at both websites for some great stamp eye candy! 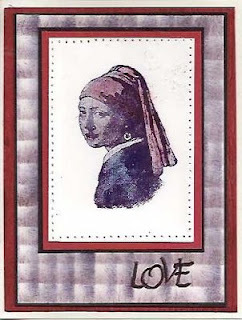 The set above, Girl with a Pearl Earring, is a representation of the painting by Johannes Vermeer. This stamp set is on the Chapel Road site. With these stamps, you can start your own "museum" of stamped images : ) The original painting is on display at the Mauritshuis museum in The Hague, though! The card I made with these beautiful stamp uses the Dragged Madras Technique from the April 2009 issue of the Technique Junkie Newsletter. I have to tell you, when I developed that technique, I had envisioned it as a accent background for "fun" style stamps. 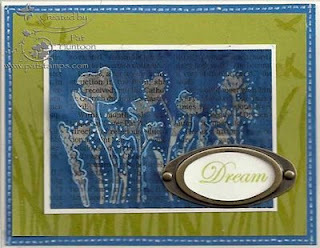 And yet here, with more somber colors, it works pretty darn well with these elegant stamps, doesn't it? Carol at Class Act has a great offer for you, too: If you purchase 2 Chapel Road Artstamp sets, you will receive a 10% discount OR If you purchase 3 or more sets, you receive a 15% discount. Make sure to let Carol know that you found this from the Technique Junkies! To enter this giveaway for the card and stamp sheet, place a note in the comments section with your entry. Enter by 11:59pm EST on Tuesday, April 28th. No other entry methods will be included in the give away. If you email me to enter, your entry will NOT be considered a valid entry. When you leave the comment, make sure to put your NAME in the comment -- if you enter your comment as "Anonymous" - or you just enter with your first name, I cannot give you the prize! Blogger does NOT record your email address for me, so you will need to check back to find out if you have won or include your email address in your comment so that I can notify you. A good way to do this is like so: phuntoon at optonline dot net -- it will help protect your privacy! I will have a random number generator pick one number from the comments to select one winner. Enter today -- good luck! Congratulations to Alice Arterburn, the winner of these stamps and the card! Today's Blogger's Challenge was a color challenge. We were to use Sage, Sahara Sand, Artichoke and Chocolate card stock on our creation. Personally, these are not colors I would have chosen to go together -- but they are GORGEOUS in person. I love challenges where I learn something new! The other players in the challenge made some gorgeous artwork, too (click on the Blogger's Challenge link on my right sidebar for the links to their blogs). Of course, a card would not be a card without a technique on it. First, I used the Drywall Stitching technique on the top panel (April 2009 issue of the TJ Newsletter). The chocolate panel also uses a TJ technique -- Cuttlebug Smoosh -- only this time, I used one of my new embossing folders from Stampin' Up!. Love those new folders! All of the stamps are Stampin' Up, too. Thanks for stopping by today -- have a nice weekend! Don't some stamps just "speak" to you? These new stamps that we are giving away from Sweet 'n Sassy Stamps speak to me -- I am a big believer in following your dreams. I think everyone should dream big and always work toward making them come true. Okay, enough philosophizing! 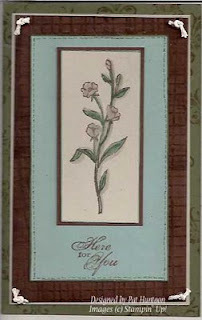 The card above uses the set (below) with the floral stamps using the Newsprint Reveal Technique (April 2009 Technique Junkie Newsletter). The kiwi background is embossed (the scan doesn't show it, but it really adds to the card, trust me!). The blue layer behind the green uses the Drywall Stitching Technique (also from the April issue of TJNL). Look at how even those stitches are! It's, well, dreamy! This is a brand-spankin' new release from Sweet 'n Sassy Stamps. This set is available individually -- or, to save even more, in a bundle with SNSS' other new releases (click here) at 10% off! Not only that, but TJ subscribers can save an additional 10% using the code iluvtjn. Hey, when you enter this giveaway, tell me if you believe in following your dreams! To enter this giveaway for the card and stamp sheet, place a note in the comments section with your entry. Enter by NOON EST on Saturday, April 18th. No other entry methods will be included in the give away. If you email me to enter, your entry will NOT be considered a valid entry. When you leave the comment, make sure to put your NAME in the comment -- if you enter your comment as "Anonymous" - or you just enter with your first name, I cannot give you the prize! Blogger does NOT record your email address for me, so you will need to check back to find out if you have won or include your email address in your comment so that I can notify you. A good way to do this is like so: phuntoon at optonline dot net -- it will help protect your privacy! I will have a random number generator pick one number from the comments to select one winner. Enter today -- good luck! Congratulations Freida Fletcher! You are the winner of this stamp set! This adorable unmounted rubber stamp sheet is called "Who We Love Most". It is from the Stampingback line from I Brake for Stamps and happens to be 15% off right now! There is also a new release from Stampingback -- a Les Miserables sheet! It is sold as a sheet or in singles. They can be found in the NEW STAMPS category. Broadway lovers rejoice! Remember that TJ members receive 10% off with the code TJ10, too. To enter this giveaway for the card and stamp sheet, place a note in the comments section with your entry. Enter by 11:59pm EST on Sunday, April 12th. No other entry methods will be included in the give away. If you email me to enter, your entry will NOT be considered a valid entry. When you leave the comment, make sure to put your NAME in the comment -- if you enter your comment as "Anonymous" - or you just enter with your first name, I cannot give you the prize! Blogger does NOT record your email address for me, so you will need to check back to find out if you have won or include your email address in your comment so that I can notify you. A good way to do this is like so: phuntoon at optonline dot net -- it will help protect your privacy! I will have a random number generator pick one number from the comments to select one winner. Enter today -- good luck! Susan Honeycutt is the winner of these stamps! Congrats! Some stamps are just irresistible. What I CAN resist is the commentary that I REALLY want to make about the gist of the card. I am just NOT going to say what I am thinking! This card uses the Bingo Blast Technique from the April 2009 issue of the Technique Junkie Newsletter. I used Radiant Rain Dabbers in place of the Bingo Markers -- they shimmer! The stamps are from I Brake for Stamps. 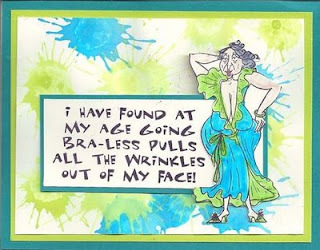 May your day be wrinkle-free. I have been meaning to share this card FOREVER! 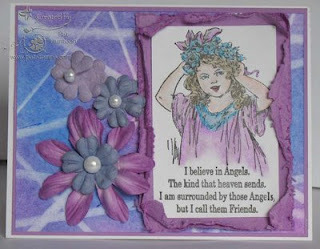 I made the front panel of this card as an idea for an ATC swap I was in -- then I decided to go in a different direction. 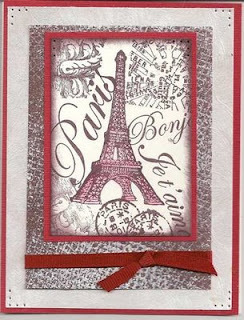 The Eiffel tower is from Innovative Stamp Creations, and the words and other stamps are from the Stampsmith set in the giveaway (sign up for the giveaway on the post HERE). That is layered on a piece of Painted Mesh, which is a technique from the December 2008 issue of the Technique Junkie Newsletter. Those layers are on a piece of Vintage Silver Lustre from The Paper Temptress -- I have to tell you, the paper is so luxurious that I was loathe to use it! Unfortunately, it doesn't show well in the scan, but it really makes the card. Weekly giveaway: Stampsmith meets the Cuttlebug! Bonjour Mon Amis! 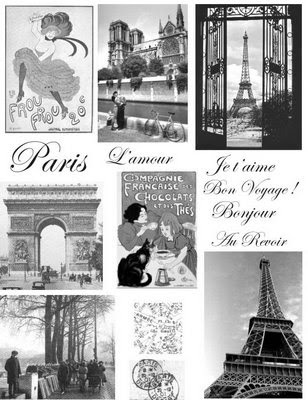 Who wouldn't want to go to Paris in the spring?Ohh la la! 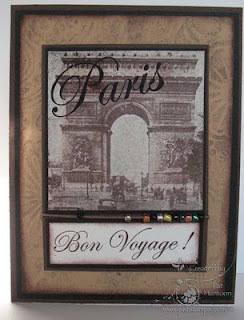 I can't take you to Paris, but I CAN offer you a change at winning these magnifique Paris stamps by The Stampsmith. This huge 8-1/2" x 11" sheet of stamps will be given to one lucky winner along with the card below on Monday morning....will it be you? The card made with this sheet of stamps features the Cuttlebug Stamps Technique from the April 2009 issue of the Technique Junkie Newsletter. I just love this technique! So EASY, and once you make the stamp, you can use it until you "tire" of it : ) The front panel, with the Arc d'Triomphe, was brayered onto white glossy cardstock, then colored lightly with chalks. Anyone can win these stamps -- you do not need to be a newsletter subscriber. To win, simply leave me a comment on this post. let me know why you would like to go to Paris in the Spring (or why you love your Cuttlebug!). Make sure I can identify you by your post and remember that blogger does NOT send me your email address. I will pick a winner from all entries on Monday April 6th at 9 am EST. Laurie Schierer is the lucky winner of this set of stamps!